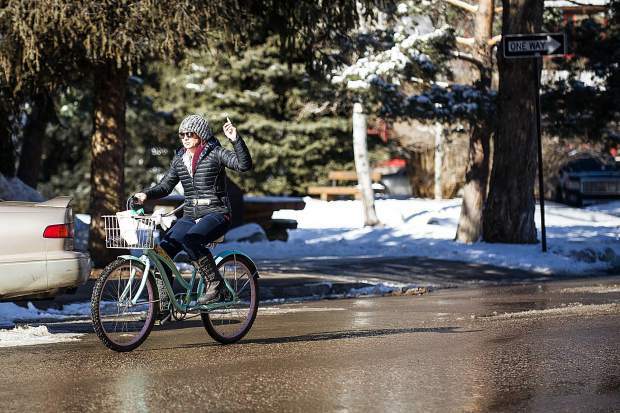 A woman signals her turn while riding her bike on Monarch Street in Aspen. Just over $7,000 was spent last year for elected officials and city of Aspen staffers to travel to four cities in an effort to drum up support for a million-dollar mobility lab that’s designed to provide alternative transit options to the car. Mayor Steve Skadron went on all the trips, which were to Denver, Detroit, Cleveland and San Francisco. Fellow council members and city officials also traveled in the hopes of getting support — financially and collaboratively — on what was supposed to be a plan that was rolled out this year. 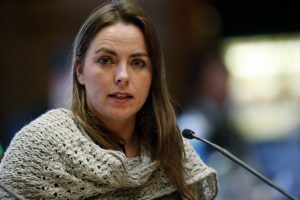 But after meeting with auto manufacturers, Aspen officials realized they were behind the companies’ fiscal budget planning and the money wasn’t available. The city pushed the mobility lab to 2019 and is spending the next several months planning for it. It’s likely that the city will pay for the majority of the pilot program, which could cost a couple million dollars. It would involve a set of incentives and transit options for motorists to leave their cars at either the Brush Creek Intercept Lot or Buttermilk, and then be whisked into Aspen by driverless cars or transport vans. The fourth stop on the transportation traveling tour was last fall in San Francisco and was one of two visits made there by Aspen officials. “This trip was when we changed our strategy,” said Ashley Perl, the city’s climate action manager, adding that she and Skadron gained a lot of insight on how to find the right people and companies to partner with. Perl said they worked with a consultant who put them in touch with tech departments within auto manufacturing companies that are working on transportation innovations. “We are now having them come to us,” she said of possible in-kind partnerships with smaller start-ups that could provide side pieces of the lab, such as e-bikes. Skadron said the trips he made were worthwhile on a number of fronts, and the fact that no one in the auto companies turned them away was a good sign. The trips were whirlwind fly-ins with networkers, consultants, transportation czars and about a dozen car companies. He cited an example in which one of his contacts got Google CEO Eric Schmidt to give him an in with Waymo, an autonomous car development company and a subsidiary of Google. 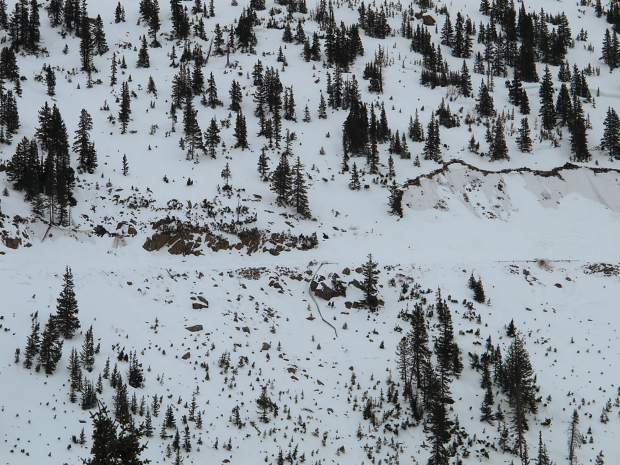 Skadron said when he embarked on climate change initiatives and alternative transportation models in 2014, he found himself in front of people who were showing him possibilities for Aspen that hadn’t been thought of. “My worlds were aligning with all of these people,” he said. Councilwoman Ann Mullins went with Skadron to Detroit, which was one of the first fundraising trips. They met with Jessica Robinson, the director of city solutions for Ford Motor Co. They talked about innovations within the company that could align with what Aspen is doing. There’s some irony in the fact that she and Skadron rented a car on their Detroit trip, since it was based around an attempt to get valley residents out of theirs. “The irony is that there was no other way to get to Dearborn,” Mullins said of Ford Motor Co.’s headquarters, which is 12 miles from the airport. Skadron said renting a car is never his first option when traveling on the city’s dime, and he tries to keep the expenses as low as possible. In San Francisco, he took public transportation as far as he could, then rode in a car via Uber. On the first of two San Francisco trips, he and Perl stayed the night near the airport at the Fairfield Inn and then a place called the Seal Rock Inn on the outskirts of the city. “I would describe it as scary,” Skadron said. On the second trip, Councilman Adam Frisch joined Skadron. Perl said starting next month, there will be a series “pop up” events and listening sessions throughout the valley. They’ll be designed to gauge whether people will use the incentives provided by the city to get them out of their cars, and if they think there is merit to the idea. Skadron said it’s important to him to get the lab going before he leaves office in June 2019 (he will leave after six years in office due to term limits). Providing alternatives to driving is better than building a four-lane highway into town, he added.